System Mechanic will always hold a special place in my heart. I was introduced to it as a technician new to performing services for consumers. We used it to automatically perform all of the tests I’d previously done manually. It was a godsend to me then, but I must admit that I haven’t actually used it for a while. Let’s take a tour of the facilities and see what we’ve got to work with shall we? 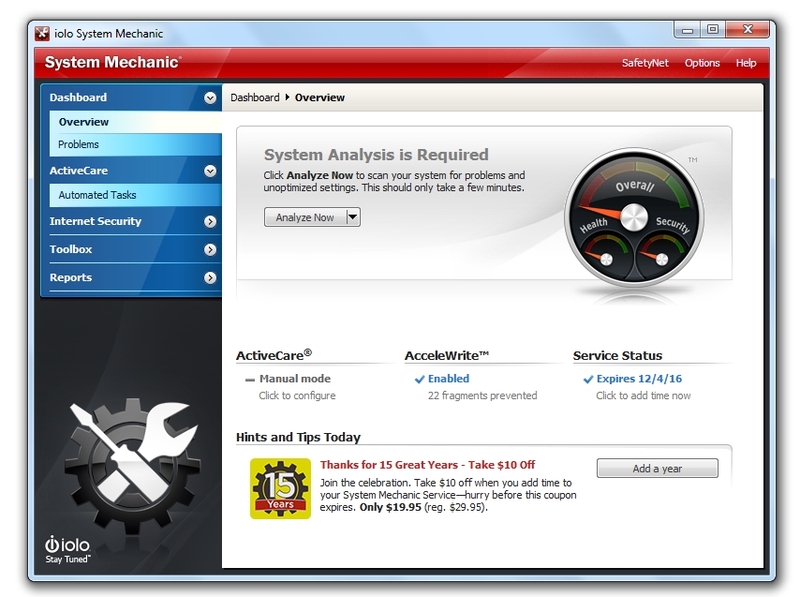 System Mechanic purports to offer more than 50 proven tools and functions utilising patented technology, and it can fix and/or prevent over 27000 PC problems and errors. That’s a lot of features and it’s certainly a lot of possible errors. How do we find and fix those errors? If you guessed with a system scan then yes indeed, you’d be absolutely correct. Opening up System Mechanic we’re presented with the Dashboard Overview. If you look closely you’ll see that it wants to analyse the system to find issues and there are two ways to do that. If we click on “analyse now” then it will automatically run a quick analysis. Clicking the drop down arrow will give us the option of running a deep scan. There’s a very real time difference involved in the two scans though. A quick analysis should take 1-2 minutes, and a deep analysis should take 5-7 minutes. You could run a scan and follow up on its recommendations straight away, but as we’re on tour, let’s have a look at some of the other features before we dive into that. Next up on our whirlwind tour of the System Mechanic landscape is found on the Dashboard overview as well. It’s called ActiveCare and according to the Dashboard it’s currently set to manual operation only. Clicking on this will take us to the ActiveCare Automated Tasks tab where we can pick and choose what we want System Mechanic to do automatically for us. This is one feature where System Mechanic outshines the competition. You can actually automate everything that System Mechanic does in its Basic Scan and enough of what it does in its Deep Scan that you’ll be able to set it and forget it. 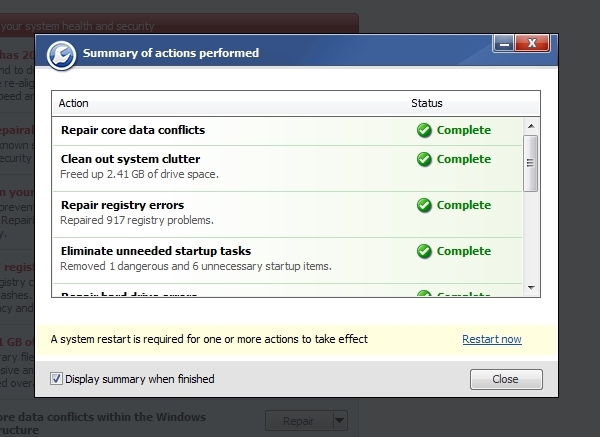 This is a big call because really, I can’t remember when I last had time to fire up the popular Registry Cleaning program that’s been installed on my computer for several years and give it a whirl, or using the same program, empty my temp files out. The best part though is unlike other programs that do offer automation, you don’t need to set a single time and then try to remember to leave your computer plugged in and/or turned on so that it can actually run. This is because similar to a large number of antivirus programs, System Mechanic will actually detect when you’ve been idle for a while and then start running the optimisations. Running on battery? System Mechanic has got you covered there as well. You don’t need to worry because it will wait until you’ve plugged back in before doing any potentially battery draining operations. You’d think that this would be enough for most cleaner programs and it probably would have been, but then iolo went and added the CRUDD remover. The CRUDD remover is a fun tool located in the Individual tool section of the ToolBox. Standing for “Commonly Redundant or Unnecessary Decelerators and Destabilizers (CRUDD) Remover™” it helps identify and eliminate duplicate programs that can overload your system. If share a PC with your kids then you’ll most likely find this tool to be quite the gem too. So now we’ve taken a quick look at a few of the major cards System Mechanic has up its sleeve, let’s see how it actually does in real life. How does one go about measuring the real life benefits that System Mechanic provides? Why, with a before and after bench mark, of course. It’s here that we run into a bit of a problem. You see I’ve recently updated my testlab – a testlab that would’ve been a perfect specimen for testing – to Windows 8. While I’m aware of the benefits associated with running System Mechanic to maintain that new PC feel, it probably wouldn’t have had a major, measurable impact. This leaves us with a 4yr old HP notebook as the sole candidate for the job. Specs wise it’s a first generation Core i7 720QM with 4GB of DDR3 RAM and a GeForce GT 230M graphics chipset. Although it had a hard drive replacement around 2 years ago, it’s still running the original Windows 7 32bit installation that it left the factory with. This is not a fast beastie by any stretch of the imagination but it is a prime candidate for the sort of TLC that System Mechanic can provide. Initial Benchmark test utilising PCmark 7 Basic Edition v1.40. The basic edition was chosen because this unit is now only used for word-processing, copying and viewing photos, basic web surfing and occasionally, watching HD video, all of which are tested quite well by the basic version of PCmark. Install and update System Mechanic to the latest version (currently 12.5). Run a Deep Analysis and perform any recommended automated actions. Perform a secondary Benchmark using PCmark 7 Basic Edition v1.40. Results of the testing are presented below. We can see from the screenshots above that there is a clear improvement in the benchmarked speed of the laptop.1 It’s not the enormous gain that probably would have been achieved had the testlab been available for use, but it is still a significant quality-of-life gain that will make my wife quite happy. The test results are in and they speak for themselves. Benchmarks prove that System Mechanic is able to repair and rejuvenate a system enough to provide a noticeable speed boost. Couple that with a program that is simple to use without foregoing any of its power and you’ve got a program that is more than worth the US$40 yearly subscription. During testing it was discovered that the hard drive on the HP used is currently in the process of remapping sectors on a large scale. We are unable to predict how this may affected any benchmarking results, but are confident that if it did affect the results it did so evenly across both sets of testing thereby negating any possible skewing of data or bias between benchmarks. Software and licensing was furnished by iolo for the purposes of this review, however no consideration was given in regards to the contents of this review.